I’ve long been a believer that storytelling has the power to change the world, one person at a time. My own life has been shaped repeatedly by stories, inviting curiosity about new things, prompting me to change my own habits with regards to the environment, opening my heart and mind to understand my own blind-spots and to try to be better... more like the heroes of stories that I've admired. A well told story can ignite a spark of compassion in the darkness of unfamiliarity and/or fear of the unknown. An empathetic narrative can shift a long-held perspective, opening a mind to something previously unimaginable. There’s certainly no shortage of stories of all forms from literature to film to theatre that have done this over the millennia. But, wow... how lucky we are to be alive... right now. Hamilton, An American Musical is arguably one of the most impactful examples of culturally groundbreaking storytelling of our time (of a lot of times). A narrative told powerfully enough to rewrite the rules of musical theatre to connect with today's audiences and rewrite the rules of diverse representation in historical storytelling all at once. Even if you haven't seen the show you've probably heard about the intoxicating juxtaposition of a heart-wrenching true story, brilliantly written music, creative narrative elements, unexpectedly disarming humor and extraordinary talent on every corner of the stage. The mash-up of elements is truly unlike anything any of us have ever experienced. Lin-Manuel Miranda’s decision to cast historical figures as actors of color re-frames our understanding of history and allows today’s young immigrants a chance to see themselves mirrored in the faces, voices and hearts of the founders of our country. To see their ancestors as real life heroes, forging new alliances, loving, trying, failing, problem-solving, fighting, inventing and creating. Such a simple but profound shift invites ALL of us to see a visual representation of our founders for who they were: a band of “young, scrappy and hungry” immigrants coming together to build something brand new. To aspire, to dream, to fight and to create. How could that story NOT inspire hope in young people and theatre-goers of today?? In people of all ages really -- just listening to the soundtrack as a story inspired me so deeply that I picked up a copy of the Federalist Papers and read them for the first time at the age of forty-seven. And I speak as someone who strongly disliked history class as a kid! I've become a more informed citizen and increased my personal admiration for and investment in my own democracy. Because of a theatrical story. All that being said, it's what Lin-Manuel Miranda has done following the extraordinary success of this musical that I find perhaps even more impressive. In collaboration with others, together they have worked in powerful ways to extend the reach of this impactful story far beyond the typical theatre crowd . Since the show itself connected with audiences in such a profound way and quickly became a phenomenon accompanied by sold out audiences and high priced ticket-scalping (despite Lin-Manuel's explicit desires to avoid this), he wanted a way to reach younger, low income audiences. 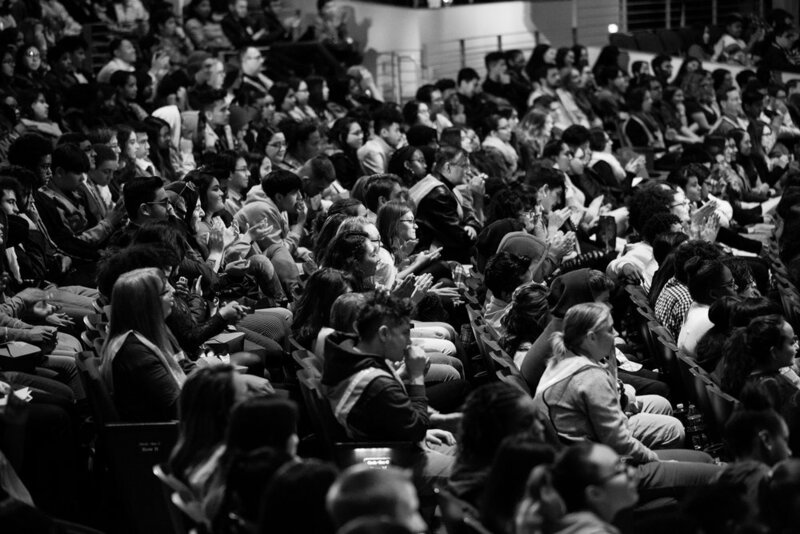 A way for students to become moved by the story, and, importantly, to see themselves reflected on that stage and spark inspiration in the hearts of young people of all backgrounds. In a collaboration with the Rockefeller Foundation, the Gilder Lehrman Institute and others, #EduHam was born. I first learned of this through a friend in the Broadway cast who shared his passion and perspective on #EduHam through social media. Watching how deeply he was moved by the investment made by students in the material they were studying was profound. So when I was invited to document this program first hand, I jumped at the chance. 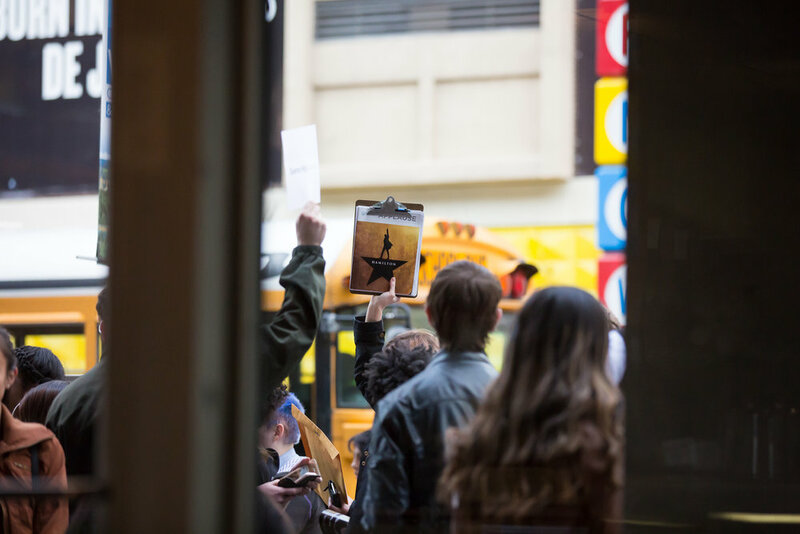 The Hamilton Education Program now collaborates with local low income and Title One schools in New York, and for one day in each city that the tour visits. High school juniors start by studying the historical content of the play in their high school classes. 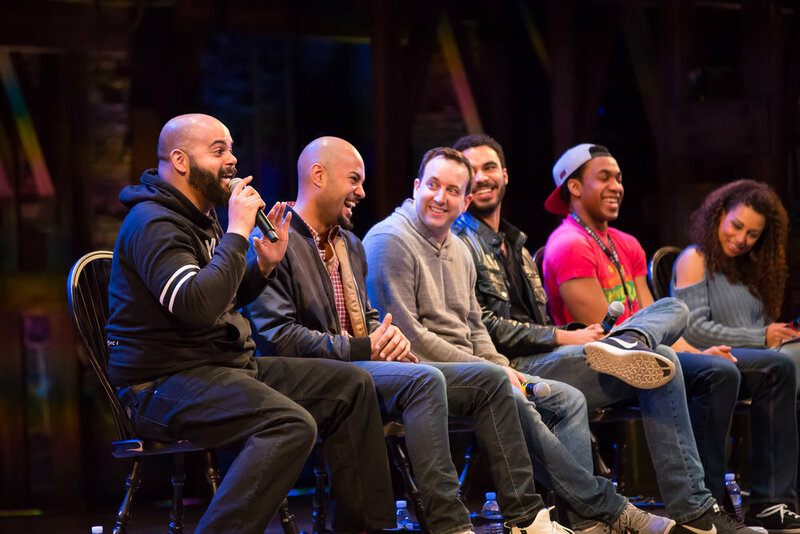 In order to more deeply engage students with the material, they then write their own Hamilton-inspired hip-hop and rap poems, songs and skits to perform for each other. No longer is history stuck in a dry textbook. It comes alive in their hearts and through their own performances. Ultimately they compete for a chance to perform their acts live in front of thousands of other high school juniors (and the cast of Hamilton) on the very stage where the magic happens. Their performances are followed by a spirited Q&A with members from the cast. And finally, after soaking in each other’s brave and moving performances, they get to sit back and enjoy a matinee performance of the hottest (and most sold out) show around. What a thrill it was to document this day for the Gilder Lehrman Institute when the Hamilton Education Program came to Denver. The students’ performances were brave, thoughtful, intimate, raw, and ranged in tone from funny to profound to deeply moving (I've got a link below where you can watch them for yourself on the Denver Center blog). I could feel their connection and commitment to the historical material, and how perfectly each of them met the moment of our present day issues with their own material. 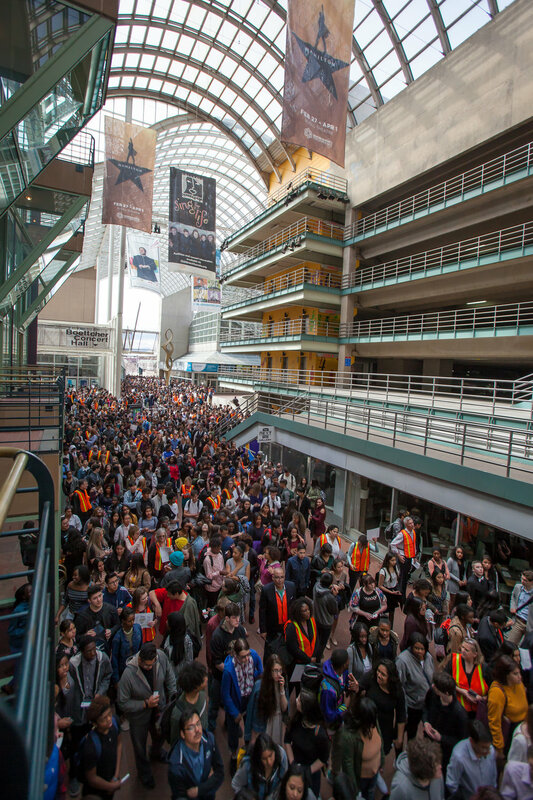 What a privilege it was to then sit in the audience for a matinee performance of Hamilton with this group of nearly 3,000 high school juniors, many of whom had never been to the theatre. The show brought me to tears (if you've seen it, you know! ), but just as moving during this particular performance was the visceral feeling in the theater of their reactions to the story as they invested their hearts and engaged, often audibly, with the unfolding twists and turns of the story. At the end of the day, who else could get nearly three thousand high school juniors to cheer during a debate in a cabinet meeting about the structure of state debt? To see the student performances from the Denver tour, please visit the Denver Center’s post featuring videos. ABOUT THE PHOTOGRAPHER: Jennifer Koskinen is an internationally published theatre, dance and stage production photographer based in Denver Colorado. She is the production photographer for the Colorado Shakespeare Festival after having photographed multiple seasons for the Denver Center for Performing Arts Theatre Company. She has also volunteered with the Denver School of the Arts Theatre Department, capturing actor headshots and staged productions for the past 6 years. Her photos have appeared in around the world, and in publications such as the New York Times, Playbill, American Theatre Magazine, The Denver Post, and Broadway World, to name just a few.